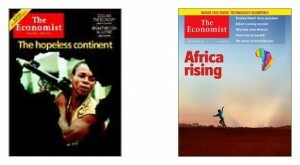 In May 2000 The Economist dubbed Africa "The Hopeless Continent"...clearly this declaration was a contrarian indicator as 11 years later the same august periodical announced from its cover that Africa was rising and following in the footsteps of Asia. Is this in turn a subsequent contrarian indication? Does the new embrace of Africa indicate old news? Is it sustainable? Is it real? Is it too late? Too early? Perhaps the real question is 'are American companies going to make money in Africa?' because of course it's real. A continent with multiple distinct regional characters, struggling with integration and beset with corruption and conflict is intimidating. At the same time a continent with vast natural resources, the most compelling demographics of any on earth and the last to "emerge" among emerging markets offers tremendous opportunity. So US SMEs (small and medium size enterprises) can ruminate, rub their chins and obsess over the isolated pockets of Africa which may still resemble Conrad's heart of darkness. Alternatively they can acknowledge the many gaps in their knowledge, but commit to participating in the eminently predictable and exciting growth opportunity. Are there complications? Will there be frustrations? Of course. Does your business in Newark or Denver or Miami or Dallas proceed without hiccup? It's business. There are hassles. As Nku Nyembezi-Heita, CEO of Arcelor Mittal South Africa and one of Forbes Magazines 2011 "World's Most Powerful Black Women" said at Harvard Business School's 2012 African Business Conference, no matter how much we might dislike corruption and inept governance, wishing won't change it. We must deal with the facts as they exist, and innovate around the impediments. So for an American SME considering launching or reinvigorating its international business development program, where to go? NAFTA is easy. ASEAN is a must as are key markets in Latin America. Eastern Europe has some interesting possibilities....and Africa. Don't waste this opportunity. Consilium Global Business Advisors provides a variety of actionable strategic advisory and tactical execution steps in support of innovative international business development efforts. Our integrated export assistance advisory model helps companies select proper markets, prepare for international business, and execute on profitable initiatives.